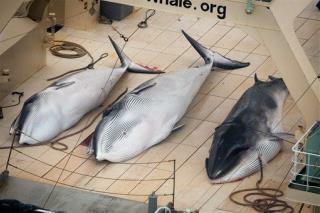 (Newser) – Japanese whalers sailed to the Antarctic in December with the goal of killing 333 minke whales. Discover reports they returned Thursday having met that goal. Japan signed on to an international moratorium banning whale hunting in 1986 but has since been taking advantage of a loophole that allows killing whales in the name of "scientific research." In what can only be seen as a particularly bold claim, Japan says it's killing whales as part of research meant to prove there are enough whales for them to hunt commercially. For years the country has insisted most whales aren't actually endangered, seeking to return to hunting whales for food, according to Reuters. Gooks will eat anything from the ocean,China is even worse ? ?